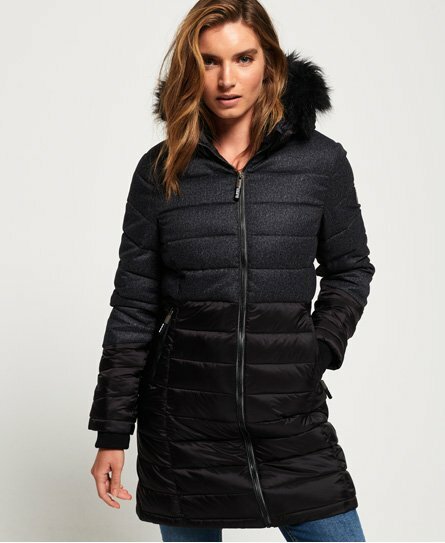 Superdry women’s Luxe super Fuji mix jacket. Stay protected from the elements this season in this longer length Fuji mix jacket, featuring a removable hood with bungee cord adjusters, faux fur trim detailing, front zip fastening and two zip front pockets to keep your belongings safe. The Luxe super Fuji mix jacket also benefits from ribbed cuffs and its quilted design to provide added comfort and style. For the finishing touch, this jacket has a Superdry Mountain Goods badge on the sleeve.